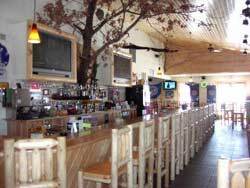 Built new in Dec 2006, Cross Country Bar and Grill is located between Eagle River and Rhinelander WI on Highway 17. We think you will agree that it is a unique and exciting atmosphere that is one of a kind to this area. We are located directly on the snowmobile trail which allows all of you snowmobilers easy access to stop to warm up and enjoy one of our excellent menu items. There are also miles of Town and County Roads available for those that want to ride ATV/UTV’s. We have parking for those of you who need to drop and ride. There are many places on our property to leave your vehicle/trailer while you ride. For you sports fans, Cross Country Bar and Grill is well equipped with 14 LCD flat panel TV’s. There is literally not a bad seat in the house, whether you are out to watch your favorite team, or just relax while listening to the music videos. If you are looking for a great place to have a surprise party, wedding/baby shower, family reunion, rehearsal dinner, or just about any other get together you can imagine, we are ready to handle your needs. We have installed a great outdoor patio with seating for as many as 60+ people to accommodate the spring/summer/fall parties. You can enjoy the outdoors while playing on one of our sand volleyball courts, or pitch horseshoes on one of our horseshoe pits. We have great chefs that can provide many different tasty treats for all of you. For parties 6 or more we ask that you call at least one day ahead of time so we can be properly staffed to meet all of your needs and provide the best customer service possible! Our menu is simple, yet second to none in terms of quality. Whether you order a burger or sandwich, pizza or wings, or just an appetizer, we know that our food is as good as it comes. Our all day Friday Fish Fry is equally as fabulous. Our fish fry includes Haddock ( grilled or deep fried ), Lake Perch, Jumbo Stuffed Shrimp or Northern Pike. Come in and give us a try and we are confident you will return again.